​Everyday before I leave my house, this is what I see. It’s important to stay motivated and inspired while serving. People have sent postcards, greeting cards, and letters from all over the world during my time in Swaziland. I’m extremely grateful to all of those who have taken the time to write kind words and send them to me. To make my house feel more homey, I added pictures of those responsible for my being to the inspiration wall. 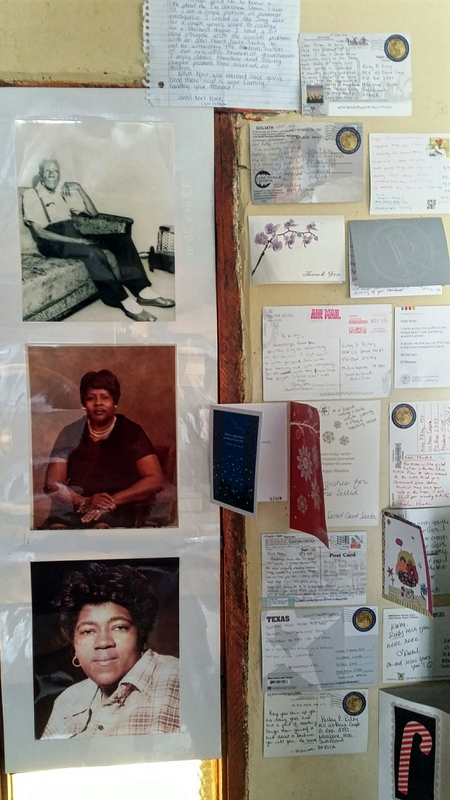 They include my great grandfather, his daughter (my grandmother), and her daughter (my mother). It was on this day seven years ago that my mother passed away. She’s actually (partially) responsible for my serving in the Peace Corps. She pushed us to serve others with compassion. She instilled a sense of exploration. She made sure that we respected and embraced those who might be different from us. Having these visual reminders has been great for keeping me motivated in the rural community. It makes my service feel a little less lonely. This past Thursday was Thanksgiving, an American holiday of food, family, and football. For those who may not know, Thanksgiving isn’t celebrated here in Swaziland. It’s simply another Thursday in November. For the occasion, our country director invited all of the volunteers in Swaziland to her beautiful home for a momentous feast. I wasn’t able to get pictures of all of the food, but the above collage is a bit of what our eyes and tastebuds enjoyed on Thursday afternoon. While the chefs were putting the final touches on the meal, I was able to relax by the pool and chat with other volunteers. There was also badminton and other backyard games to be played. This was definitely the first Thanksgiving that I was able to chill in a pool and soak up some sun. I could used to Thanksgiving as a summer holiday. Several volunteers and staff helped prepare various delicious dishes. It was indeed, a feast. There were four turkeys (two baked, two fried), a roasted pig, and a sizeable salmon. We enjoyed several types of stuffing, macaroni and cheese, fried cabbage, mashed potatoes, candied yams, green bean casserole and more. There were appetizers to whet our palettes, and desserts to satisfy the most distinguishing sweet tooth. I have a newfound respect and admiration for those who host large holiday gatherings at their home. There were more than 70 of us. There were dietary restrictions and food allergies to be observed, but there was still something for everyone. 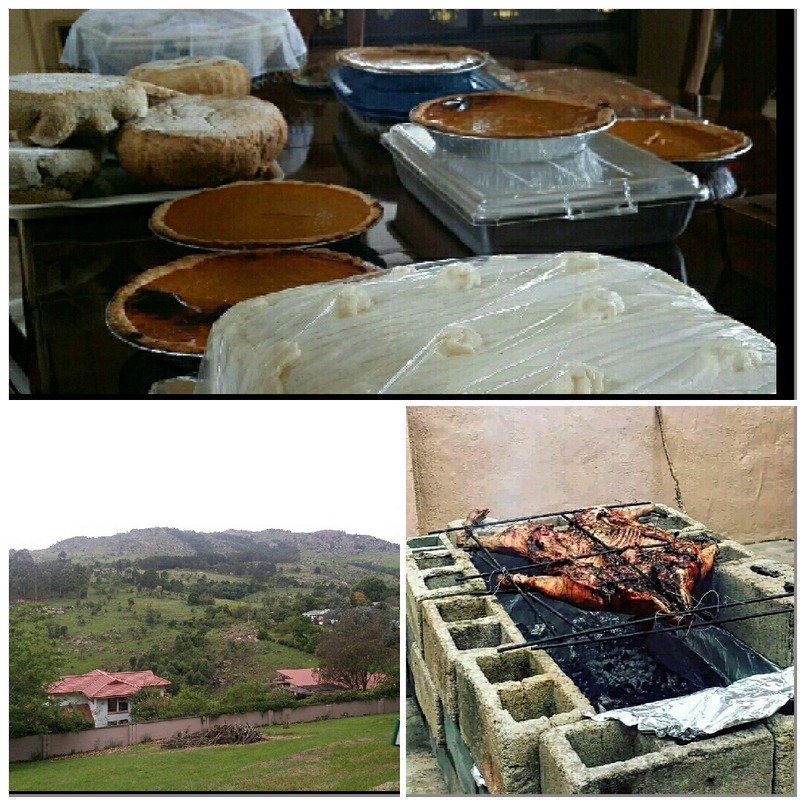 I wanted to take this opportunity to publicly give thanks and gratitude to our country director for hosting us in her home (and for taking suggestions on the menu); all of the volunteers here in Swaziland, for being a supportive and amazing group of folks; all of the chefs who made the meal magical; and my brother and uncle, for WhatsApping me their Thanksgiving greetings.